When new movies come out, the actors show up on talk shows and entertainment shows. When a tour comes to town, or a new album is released, the musicians are interviewed by TimeOut and, apparently, Gothamist. Shara Worden is doing her duty as My Brightest Diamond's leader. Check out how TONY highlights Shara Worden's apartment, and read the Gothamist Q&A here. 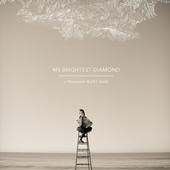 The image is the cover of A Thousand Shark's Teeth, the new album from My Brightest Diamond.